Background: Reduced port cholecystectomy either as needlescopic or hybrid-SILS cholecystectomy challenges the classic laparoscopic approach since it holds the promise of a smaller footprint and perhaps improved patient outcome. We present our comparative results, retrospectively, between these different operative techniques. 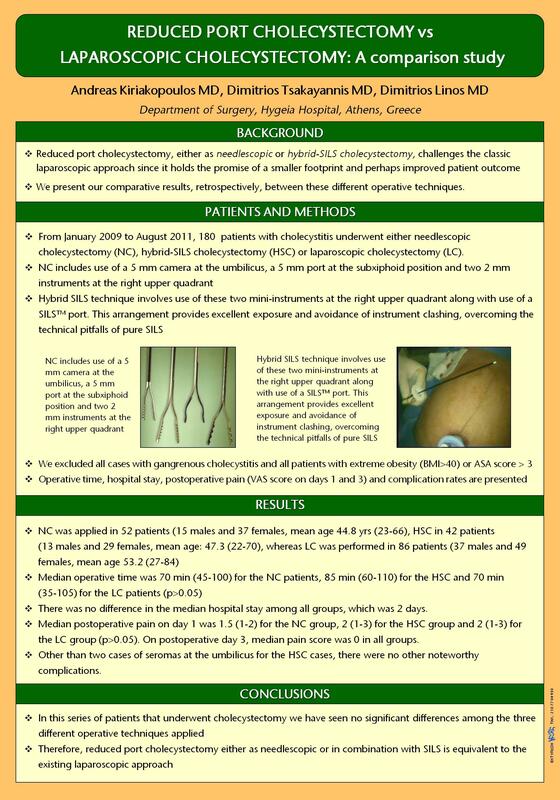 Patients and Methods: From January 2009 to August 2011, a total of 180 (one hundred and eighty) patients with cholecystitis underwent either needlescopic cholecystectomy (NC), hybrid-SILS cholecystectomy (HSC) or laparoscopic cholecystectomy (LC). NC includes use of a 5 mm camera at the umbilicus, a 5 mm port at the subxiphoid position and two 2 mm instruments at the right upper quadrant. Hybrid SILS technique involves use of these two mini-instruments at the right upper quadrant along with use of a SILS™ port. This arrangement provides excellent exposure and avoidance of instrument clashing, overcoming the technical pitfalls of pure SILS. We excluded all cases with gangrenous cholecystitis and all patients with extreme obesity (BMI>40) or ASA score > 3. Operative time, hospital stay, postoperative pain (VAS score on days 1 and 3) and complication rates are presented. Statistical analysis was performed. Results: NC was applied in 52 patients (15 males and 37 females, mean age 44.8 yrs (23-66), HSC in 42 patients (13 males and 29 females, mean age: 47.3 (22-70), whereas LC was performed in 86 patients (37 males and 49 females, mean age 53.2 (27-84). Median operative time was 70 min (45-100) for the NC patients, 85 min (60-110) for the HSC and 70 min (35-105) for the LC patients (p>0.05). There was no difference in the median hospital stay among all groups, which was 2 days. Median postoperative pain on day 1 was 1.5 (1-2) for the NC group, 2 (1-3) for the HSC group and 2 (1-3) for the LC group (p>0.05). On postoperative day 3, median pain score was 0 in all groups. Other than two cases of seromas at the umbilicus for the HSC cases, there were no other noteworthy complications. Conclusion: In this series of patients that underwent cholecystectomy we have seen no significant differences among the three different operative techniques applied. Therefore, reduced port cholecystectomy either as needlescopic or in combination with SILS is equivalent to the existing laparoscopic approach.